Those of you who know me likely suspected that I lacked the computer skills to set up this blog. You would have been correct and, if you doubted that I actually knew how to post these entries or amend them, you would also be right. Daughter Karen, to whom I have been sending my scribblings for a while, kept suggesting that I start a blog. I, of course, kept saying, “Yeah, yeah.” And did nothing. So she created the thing. Now when I send something to her, she posts it and adds any pictures she deems appropriate from her collection or mine. She is my “blogmaster”. There, I feel better having confessed. And, thanks Karen. When I sent her the “My Captain” piece she did some research on the Internet concerning the Brigantine Yankee and Captain Kimberly. She discovered that Cap was alive and well and living in New Smyrna Beach, Florida. After tracking down his address and phone number I vowed to go and see him when Loi and I visited Florida to spend some time with our friends Pete and Shirley. We are in the midst of that expedition as I write this. 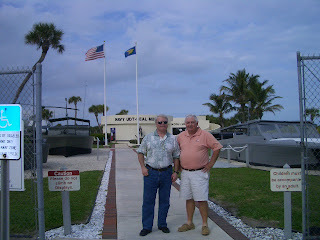 This week, after a visit to the UDT/SEAL Museum in Ft. Pierce and a stop in Vero Beach to spend some time with a mutual high school pal, we made the jaunt up to see the Skipper. 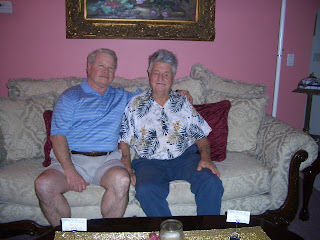 He’s 87 or 88 now (he could not be certain which) and living in a group home with six other folks. It’s a good set up. He’s got his own large bedroom and private bath and is allowed to have his aging dog, Lucky, with him. His room is filled with memorabilia from his decades at sea including several models of square-rigged ships he’s building. The place is located right on the river front where it joins the ocean so he’s not far from the salt water where he’s spent his entire adult life. I would like to think that he remembered me after 46+ years, but I don’t think so. Hundreds of eager young deck hands must have sailed under him over the years and a lot of water has passed beneath his keel since then. We talked about the Yankee, Frank the foul tempered but brilliant cook and Mel the First Mate from Marblehead. He described the around the World trip he took on her and how he met his wife Gloria aboard and married her when the Yankee reached Tahiti. Sadly, his wife died two years ago. For reasons he did not explain, he left the Yankee mid-way through the trip and several subsequent captains failed to bring her home. She was eventually blown on to a reef in the South Pacific and destroyed. Cap was obviously saddened by that turn of events for he loved the Yankee. “She was a fine ship,” he said. As I have said in the past, any praise from Cap is high praise. The Skipper explained how he and his wife acquired a ketch and began running charters out of St. Thomas. 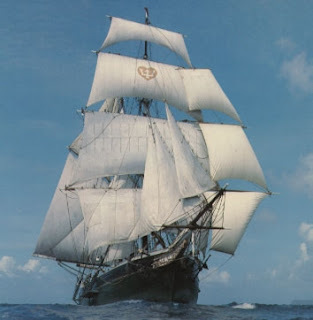 They were looking for a square-rigged ship but costs and availability were problems. Then luck smiled on them. 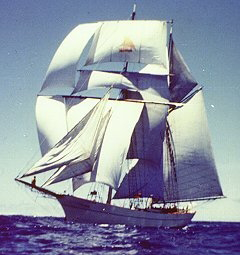 A film company had rigged a Baltic schooner as a “pure Brigantine” for the film “Hawaii”. Once the filming was complete they just wanted to get rid of it. Being in the right place at the right time Cap and his wife were able to purchase the ship for the ridiculous price of $30,000. 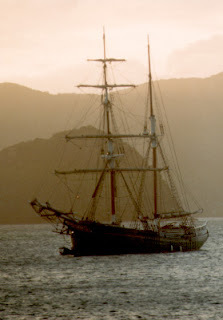 They named her Romance and began twenty-five years of deep-water charters. They did two circum-navigations of the World and several trips into the South Pacific, as well as charters in the Bahamas. The hundreds of people who sailed with the Kimberlys maintain an association with get togethers and a website. Clearly, the Kimberlys were loved by many. Sadly, the Romance is also at the bottom of the sea. She was heavily damaged while at anchor in the Bahamas and had to be scuttled. I believe the Kimberlys had left the ship by that time and others owned it. After an hour and a half of conversation it was dinnertime at the home and time for us to leave. He walked us to the car and shook my hand in his claw like grip. He clearly relished having visitors and hated to see us go. He obviously loved talking sailing and ships. At times he seemed lucid and occasionally a little vague as I guess you would expect of someone who is 87, or maybe 88, years old. But, to me he was the same old Captain and had changed far less than the fresh faced 18 year old that had come aboard his ship in 1960. Smooth sailin’, Skipper. And, thanks.